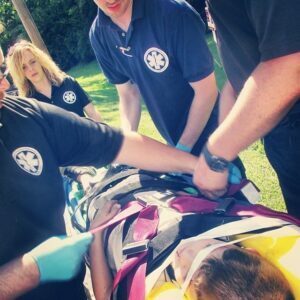 An Advanced Emergency Medical Technician, or AEMT, is a step between the EMT and the Paramedic. The AEMT certification is new to the Commonwealth of Kentucky. The AEMT gives EMS providers a stepping stone between the two levels of credentialing. An AEMT is positioned or intended to help alleviate the gap between the EMT and Paramedic by allowing EMTs to progress towards licensure as a Paramedic and use more advanced skills to ensure patient wellbeing. AEMTs are also responsible for advanced and critical care in emergency situations. Like Paramedics and EMTs, they typically work in the emergency care setting such as an ambulance service, fire department, air medical transport or in the hospital setting. AEMTs provide enriched levels of care for medical emergencies and trauma care. This course is designed to prepare you with more than an advance understanding of emergency medicine compared to the EMT. AEMTs are accountable for everything that an EMT performs along with more specialized lifesaving skills. AEMTs are able to provide more advanced care by utilizing specialized training such as intravenous access, administration of emergency care medications and provide advanced airway procedures for patients as a part of their care. At EMTP our knowledgeable educators will help you master the skills and responsibilities that bridge the gap between and EMT and AEMT. EMTP incorporates simulated patients to provide realistic learning opportunities for students. We understand that students going through this course have the added knowledge and experience since many already work in the field as an EMT. We practice our skills not only in the classroom but outdoors and in replicated situations to get practical experience. This fun and unique approach helps EMTP have one of the highest success rates for students!